At the Auto Glass Warehouse, we highly value your business. For Sarasota windshield replacement, we want to be your go-to place for all your auto glass needs. Our experienced technicians are ready to help you with your windshield repair or replacement and any other type of auto glass you may need. Some of the other types of auto glass services our technicians can help you with include back glass, door glass, power door motor and assemblies to name a few. Our staff strives to have complete satisfaction for all of our customers no matter what their auto glass needs are. Give us a call today! The urethane used by all Auto Glass Warehouse technicians is rapid cure with superior adhesive qualities to ensure you and your families safety. It allows for not only a quick drive away time, but also the ability to wash your vehicle after 1 hour. If your auto glass required tape for accurate placement while curing, it can be removed after 1 hour. In Sarasota Florida, we all know the weather is unpredictable. 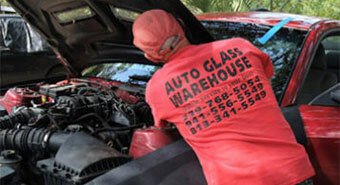 Our technicians know they may encounter weather obstacles during auto glass replacements in Sarasota. We do, however, ask that if you have a garage or carport to park your car under, you do so. 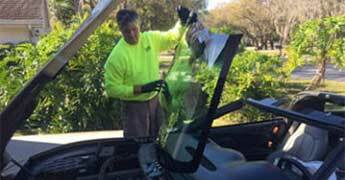 This will ensure that our technicians provide you with a quality Sarasota windshield replacement while keeping your car protected.If there is rain in the forecast but your vehicle can be parked under a carport or in your garage, our technicians will still be able to replace your auto glass. However, if you do not have either of these, your appointment may need to be scheduled at a different time that day or rescheduled to another date. To help keep our technicians out of the heat, please consider parking your vehicle in a shaded area. To schedule a Sarasota windshield replacement please call 941-556-5549 today!